Cleaning and maintaining your vinyl fence will keep it looking as good as the day you installed it. Vinyl fences are some of the most popular on the market because they are incredibly easy to clean and virtually maintenance-free. However, maintenance-free doesn’t mean you never have to tidy them up! Here are the simple steps you need to clean up your vinyl fence before company comes. Chances are, you chose a vinyl fence because they are so simple and low maintenance. However, you should still clean them at least once a year. Over time, grime, dirt, debris, plant clippings, grass, and algae can accumulate. First, you should gather your materials. You need a stiff scrub brush with nylon bristles, a vinyl-safe soap, a gallon bucket that can easily hold soapy water and the sponge you’re using, and a garden hose to clean up once you’re done. 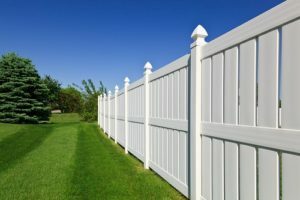 If you don’t want to purchase a vinyl fence cleaning solution, you can mix 1/3 cup of powdered laundry detergent or dish soap, 2/3 cup of trisodium phosphate cleaner, and 1 gallon of warm water. Mix everything together in the bucket and get ready to clean. Mix up your cleaning solution if you haven’t already. Grab your garden hose and wet a small section of the fence using the mist or light spray setting. Soak your scrub brush in cleaner and then use it to scrub down the fence. Pay special attention to any spots that are very dirty. Switch your garden hose over the spray setting and rinse the fence off. If there is still stuck-on dirt, use the jet setting carefully and for short bursts to get it off. Repeat all of the steps above as you need until your vinyl fence is good as new. This entry was posted on Thursday, November 30th, 2017 at 11:17 am. Both comments and pings are currently closed.